A magical scent passed from mother to daughter as a secret to seduce and bind one's true love... Wouldn't you love to have something like that? I always thought that some of my mother's recipes could serve this purpose, but apparently Bertrand Duchaufour found the real thing in Mali and was inspired by it to create Timbuktu for L'Artisan in 2004. Timbuktu was quite the sensation when it first came out and is still a striking and unique perfume. A spicy yet green incense that manages to be both fresh (in the good and full of life meaning of this word) yet warm, smoky, and touched by the desert wind. The opening of Timbuktu is deceivingly low-key. For a minute there it can be mistaken for just another light and mildly green perfume that aims to please cubicle dwellers more than Duchaufour fans. But the green (mango, by the way, and it doesn't smell anything like Un Jardin Surl le Nil) is deeply infused with peppery spices that it doesn't sit still and delivers the wearer right into the hands of resins and incense. Timbuktu becomes more dry and gains a whiff of smoke coming from a faraway campfire. The mystical part is the myrrh and incense that emerge from behind the smoke, taking shape as they come closer. The dry-down of Timbuktu is surprisingly vetivery. I'm pretty sure that this green, earthy, yet fiery note did not come from the African incense that inspired the perfumer. But it serves the purpose of pulling the fragrance together and making it last on skin for long and happy hours. In the end, Timbuktu is friendly and easy to wear. Some women might find it too masculine for their taste but I agree with the general assessment that this L'Artisan is a classic unisex scent, and a great place to start if you're new to the brand. Notes: green mango, pink pepper berries, cardamom, karo karounde flower, smokey incense of papyrus wood, patchouli, myrrh, vetiver. L'Artisan Parfumeur- Timbuktu ($100, 50ml EDT) is available from Parfum1, Luckyscent, Aedes, Henri Bendel, Barneys, and L'Artisan boutiques around the world. 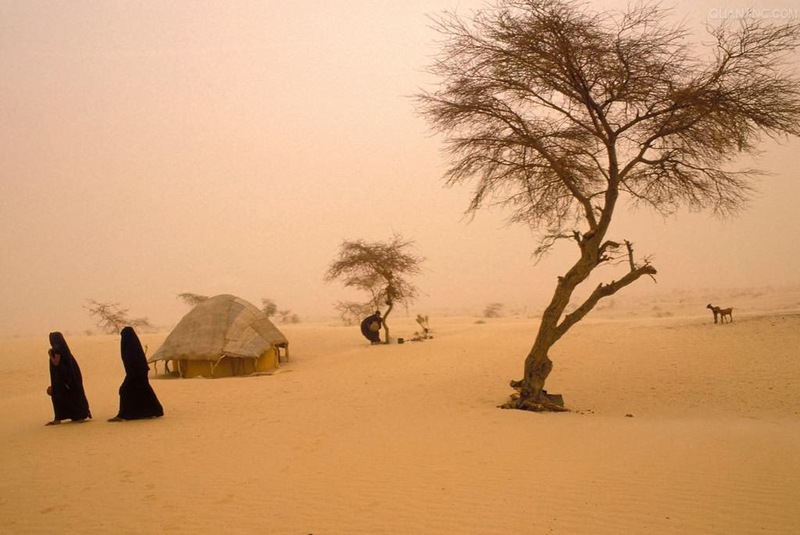 Photo: Mali, Near Timbuktu, Tuareg Camp In Harmattan Dust Storm, Edge of Sahara by Wolfgang Kaehler. I simply adore this perfume and I loved reading your review. No other perfume evokes images as strong as Timbuktu to me. Years ago I was in Tunisia and went on a desert trip. For a few moments we went into the sand dunes and it was the most eerie but peaceful feeling... only sand and blue skies wherever my eyes could reach. Strangely, Timbuktu always reminded me of that feeling. This was my first L'Artisan perfume, and indeed, my first foray into unisex and "niche" perfumery. Still a favorite! You have described it very well. Given there's mango in the mix, I've always been intimidated to wear this, but am intrigued by your description, the incense, patchouli and vetiver closed the deal for me. I'll have to try this the next time I'm in Barney's. Wonderful to read your take on this one. I loved it when it first appeared but when Dzongkha came on the scene it stole my heart instead. These days, however, Dzonghka doesn't work for me so perhaps it's time to revisit Timbuktu. Thanks for the great review. Me, too (on the stomach-turning thing). I think it gives me vague anxiety, actually, and I can't for the life of me figure out why. Especially since the fragrance is BEAUTIFUL by any standard. If I rub it out a bit the nausea-inducing quality goes away and then I can wear it and enjoy, but when I apply it straight and leave it to settle, I start feeling sick.